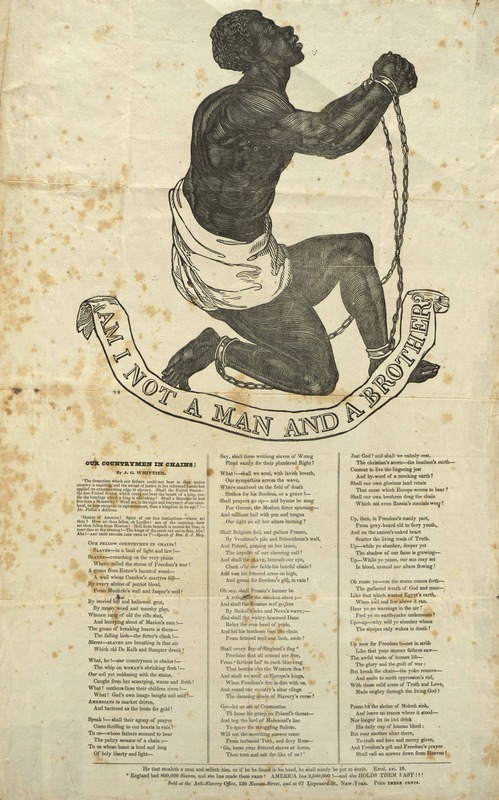 This broadside publication of John Greenleaf Whittier’s poem “Our Countrymen in Chains” includes the illustration “Am I Not a Man and a Brother?,” originally adopted as the seal of the Society for the Abolition of Slavery in England in the 1780s. The image of the supplicant male slave in chains was a popular and effective propaganda tool for anti-slavery activists who distributed the design in multiple forms, most especially in medallions made by the famed ceramics maker Josiah Wedgwood (see Anti-Slavery Medallion, by Josiah Wedgwood, 1787). Here, in addition to Whittier’s poem, the appeal to conscience against slavery continues with two further quotes, the first a the scriptural warning from Exodus and the second a staggering statistical claim about slavery in England and America. Copies of this broadside were sold at the New York Anti-Slavery Office and by mail through abolitionist newspapers, making their reach wide-ranging.